We’re gearing up for the Africa Cup of Nations, which starts this Saturday 17th January, and runs for the next few weeks to the 8th February. Held every other year, the tournament features four groups of four teams battling it out for two quarter-final places. We’ve offered our previews for the outright winner of the competition here, and the best bets for the group winners here. Now it’s time to turn our attention to group qualification, and South Africa and Cameroon both make plenty of appeal to finish in the top two of their respective groups and reach the quarter-finals. It was a woeful World Cup campaign in Brazil for Cameroon; they lost all three matches, to the hosts, Croatia and Mexico. There were also rumours of match-fixing and the poor sending off of Alex Song for an elbow during the 4-0 Croatia defeat. They may not have been expected to be among the favourites for the competition six months ago, but an excellent qualifying campaign has seen this team emerge from the shadows of former greats. Samuel Eto’o called time on his international career after the World Cup, and Alex Song didn’t feature in any of the qualifiers. He almost returned to the fold in the build-up to the tournament, but after meeting with the coach, decided to announce his international retirement instead. Neither player should be missed though, as the Indomitable Lions went unbeaten through their qualifying group, finishing clear top, four points ahead of Ivory Coast. Mali and Guinea both qualified for the tournament in 2nd place in their groups, and both only won 3 of 6 qualifying games. Neither are expected to make much impact on the competition, and Cameroon and Ivory Coast look to have every chance of getting through to the quarter-finals. On that basis, and considering they finished ahead of Ivory Coast in qualifying, Cameroon’s odds of getting through this group are very decent compared to the short odds quoted on the Elephants. South Africa are in the ‘group of death’ in group C here, but that doesn’t mean they can’t spring something of a surprise. The World Cup is still fresh in the memory, and who would have predicted that Costa Rica would find a way through the ‘group of death’ which involved England, Italy, and Uruguay? Algeria are our tip for Africa Cup of Nations glory, so we expect them to qualify from this group, but the question of who qualifies with them is more open than the odds would suggest. Ghana don’t look to be the force of old, and they may have been priced on reputation here more than on current form. The issue of World Cup bonuses remains unresolved, and the duo of Muntari and Prince-Boateng have been left out of the squad after being sent home from the World Cup in disgrace. Another negative is the recent change of manager, with former Chelsea and West Ham manager Avram Grant having been appointed in December. He has publicly questioned the fitness of his players, and will have very little time to work with them. English fans will remember the West Ham side that was relegated meekly under his supervision, and he is hardly the most inspiring of leaders. Without the likes of former legend Michael Essien and two of the best of their current crop of players, Ghana can be easily opposed in this group, and that will pave the way for either Senegal or South Africa to take advantage. Senegal are an interesting side in this tournament. They qualified particularly well – conceding just one goal in finishing second behind Tunisia – and they have a generation of exciting players. They can call on several players from the French, German, Spanish and English leagues, and will be a competitive outfit. They may need to retain that defensive solidarity, however, as they have been shorn of forward options in the build-up to the competition. Head coach, Alain Giresse, took the controversial decision to leave former Chelsea striker Demba Ba out of the squad, and that caused a stir in the media, with Ba demanding answers as to why he was left out. That decision may come back to bite the Senegalese, as within weeks West Ham’s Sakho and Southampton’s Mane were both ruled out through injury. The goal scoring responsibility will fall on Newcastle’s Papiss Cisse, and although he is a very good player, that’s three out of four top strikers ruled out of the squad. South Africa come into the tournament on the back of a 13-game unbeaten run, and topped their group in good style, despite being held to two draws at home. 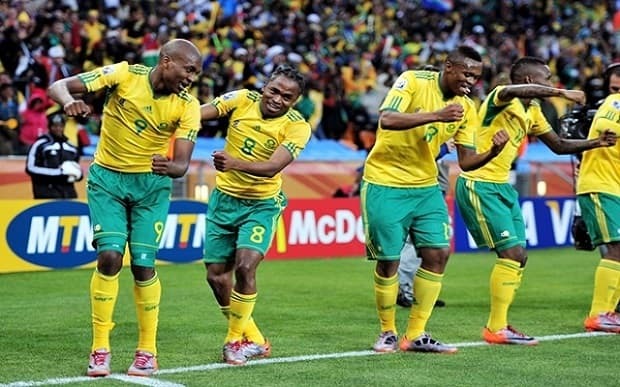 The last game in their group was away in Nigeria (the 2013 champions), and South Africa were within minutes of coming away with a 2-1 win. Nigeria came back to equalize in injury time, but it wasn’t enough, and the fact that they couldn’t beat a South Africa side that had already qualified is testament to the Bafana Bafana’s resilience. They’ve drawn with Cameroon and beaten Zambia and Ivory Coast in friendlies prior to the tournament, and you have to go back to March 2014 for their last defeat – at the hands of Brazil. The squad is made up almost exclusively of home-based players, and that togetherness could take them far. They’ve reached the quarter-finals of 5 of the 8 tournaments they’ve qualified for since their ban was lifted, and are very tempting odds to do the same this time around.